I wasn’t that confident after all. It was Lap 9/10 of the track. I normally got through these tests comfortably but something was either different about this test, this day and this level. My body wasn’t taking the fitness test in the same stride as it normally would. Mind you, I wasn’t that close to failing but I felt the noose tightening as my muscles were slowly but surely getting very tight after each interval. “Come on, come on, come on” encouraged a co-runner and teammate to the rest of the group. He was the front-runner playing motivation for us. Don’t underestimate the energy in the tank you need to do it. I was too focused on my watch’s interval time beeps to hit the gates perfectly on time and continue the momentum. My group had been the youngest I had ever run with in all the years I had refereed. It was a 4-man group and I didn’t have enough energy in the tank to run on the end so I trailed behind the inside man. Thankfully, the test administrators noticed I always kicked off my run after the whistle since I was forced to tail-gate so arriving at the cones a split second after the whistle was forgiven. 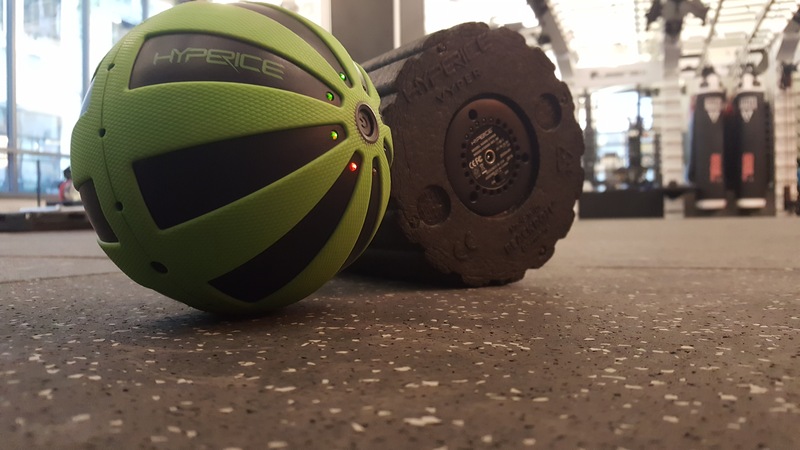 I was on the gym floor using a round hard ball called a HyperSphere (pictured left below) to release after a lower body day workout. In hindsight, not a great decision but my trainer thought I had enough recovery time before the test the next day. I had just returned from travel the day before so I was carrying travel fatigue and days upon days of not stretching and releasing muscles. It was deadlifting and squats as the compound movements on the day so I needed to stretch or I wouldn’t be starting the fitness test the next day in great shape. As I rolled the ball with my body weight over my four main muscles on my upper leg (IT bands, quads, hamstrings and adductors), it didn’t matter. They all hurt. I just needed them to hurt less by the end of it. Everyone was more or less panting. If not visibly, mentally. The test hadn’t been easy for anyone in my group. The test administrator had mentioned the test would be a helpful gauge for us to know where we’re at. It definitely was. We followed up with high-fives and hugs and proceeded to the main waiting area where there was a group cool down session. This entry was posted in My Career, Refereeing and tagged compound exercise, deadlift, fitness test, high intensity, hypersphere, interval test, recovery, releasing, squat, stretching, tight.